Ralf Kempken has been cutting and spraying multi layered stencils for years. From portraiture, urban landscapes and modernist architecture, the stencil is used to spray images in variations. The underlying concept has always been that we filter all we see through past experiences and memories. Thus followed the evolution of the stencil, which up until now had been used as the tool to produce the painting, into the artwork itself. We all screen and frame our personal view of the world and with this in mind the stencils have turned into screens. 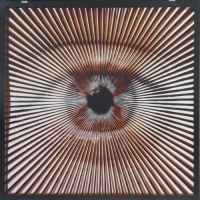 Artwork that can be seen through and create optical illusions.The screens are intended as daily reminders that we have a conscious choice in how to look at the world around us.